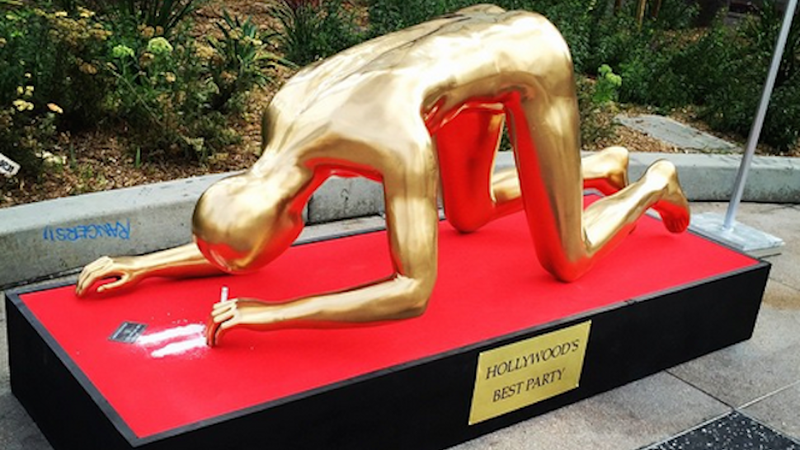 Cool piece of statement art: Street artist Plastic Jesus deposited this beautiful sculpture of the Oscar statuette sniffing cocaine right on the corner of Hollywood Boulevard and La Brea Avenue, in the vicinity of the Academy Awards ceremony venue. "The piece is intended to draw attention to Hollywood's hidden problem of drug addiction that effects hundreds of people in the showbiz industry and is largely ignored until the death of a high profile A list celebrity." Prior to Cocaine Oscar, Jesus depicted the statue with a heroin needle last year. Message received.